i got mine on the steering column. i got pulled over once and defected for various things. the cop said if id had my gauge on the pillar he could of done me for that to. Location:Melbourne and Mt Martha, Vic. In victoria, a gauge anywhere above the dash line is defectable. Not sure if it is relevent, but in my r32 my boost gauge is mounted below the leftmost edge of the instrument cluster. 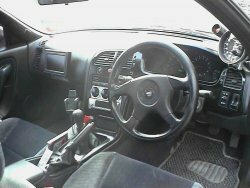 It looks pretty good there and with my aftermarket steering wheel you can see if perfectly (and its legal). Mine's mounted in the bottom right hand side under the pillar. It's "engineered" there. What use are gauges there...? 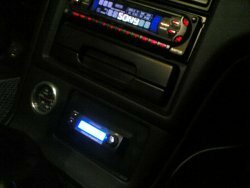 I've seen pics where the cigarette lighter on a R33 has been removed and the boost guage installed in it's place (obviously the console needed to be modified slightly to fit the guage). No offence, but the laws aren't nearly as bad here, and most things go around here........im in new zealand. 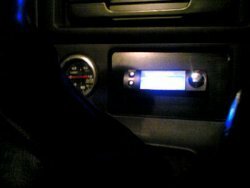 I have my boost gauge where the cigarette lighter used to be. I had to get the Dremel out to widen the hole but it looks nice and flush. I also have my turbo timer hidden in the Ash tray. once again the dremel came to the rescue. Yeah it is in a awkward position, but really, are you constantly looking at the guage. I'd be worried if you were =) lol. throw it in the bin or get a refund, the stock cluster has a boost guage. Also removed my ashtray, and made an alluminium plate to mount my ebc right in the centre of the hole that was left when I took my ashtray out. Pics are a bit crap, were taken with my phone. whats the point of an aftermarket boost guage in all honesty? do you watch what the guage is saying while you are driving? does it say anything different to the stock guage in the r33 cluster? how are you managing time to read the guage while driving if so, you should be looking at the road??? To monitor boost more accurately. Yep, it does. I can't for the life of me tell where 14psi is on it. No. But on the dyno I do. Don't look at it on the road.